As time passes, the website is programmed to send reminders to all of us. The email reminds us to visit the website and make corrections or additions to our contact and profile information. I have received numerous inquiries on how to do this. It's pretty easy. At the top of the "Homepage," notice an Icon that looks like a little person. Hover over it and click. 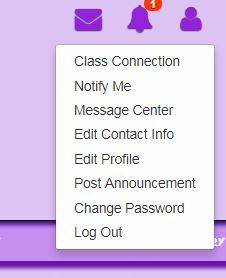 In the dropdown menu, notice several links to functions that are available to all classmates. Please keep your data up to date.